Acoustica is a universal audio editing program that offers a large range of high quality audio tools and effects. 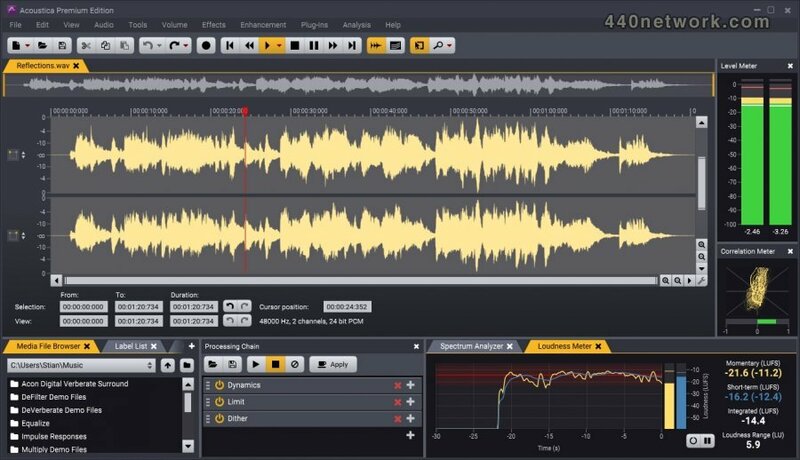 The improved audio editing engine allows unlimited undo and redo levels, ultra fast non-destructive editing and 24 or 32 bit editing with up to 192 kHz sampling rate. You can import tracks from audio CDs and create audio CDs with your edited material without leaving the program. * Added: Remember last settings in "Insert Silence"
Acoustica has among other improvements been optimized for touch devices and Windows 8. Big thanks to Intel for providing us with test hardware. The latest build fixes a problem with scanning of VST plug-ins in nested folders, an issue that in some cases prevented ASIO devices from being listed as well as several minor bug fixes. In build 51 we have added ASIO support also in the standard edition of Acoustica 5. The new build also includes several bug fixes. Build 46 of Acoustica Standard and Premium Edition 5 includes a new raw import file filter, VST latency compensation and minor bug fixes. Build 43 of Acoustica Standard and Premium Edition 5 includes keyboard customization as well as several minor improvements and bug fixes. The new CD Cover Editor lets you create CD covers from your CD projects in a breeze. The new K-System level meters help you to produce consistent sounding music while preserving appropriate dynamic range. The updated offline analysis tools allow you to select frequency and amplitude ranges. The spectrum analysis now allows logarithmic frequency scales and can show the average spectrum over a large time selection. Simulate the reverberation of physical or virtual spaces based on pre-recorded impulse responses. The new adaptive mode constantly updates the noise profile to match changes in the signal noise. * Real-time analyzers lets you analyze the output audio like a professional, including lever meter with RMS, peak and peak hold, FFT analyzer, phase correlation meter and a big time display. * The new user interface supports customizable toolbars, menus and window positioning. * New declipper restores audio recordings that suffer from digital or analog clipping. * The declicker includes a new decrackle option that eliminates short but frequent clicks (crackle) more efficiently. * Greatly improved Cleaning Wizard guides you through all the steps from connection of the stereo equipment and recording to restoration and CD burning. Great audio plugin and ver stable. 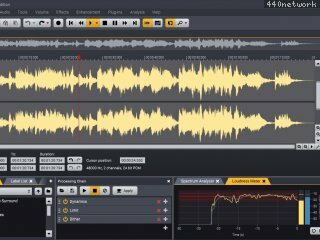 The premium version is ideal for mulchannel (5.1 or 7.1) audio treatment.